It's true. New York is officially banning hydrofracking from the state. 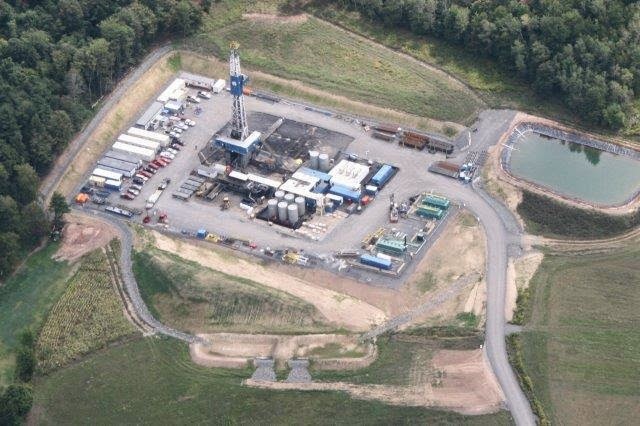 This afternoon the NYS Department of Environmental Conservation released its official Findings Statement concluding the seven-year environmental impact study on high-volume horizontal hydraulic fracturing. In remarks to the press, DEC Commissioner Joe Martens said, "After years of exhaustive research and examination of the science and facts, prohibiting high-volume hydraulic fracturing is the only reasonable alternative.” Fracking, he said, "poses significant adverse impacts to land, air, water, natural resources and potential significant public health impacts that cannot be adequately mitigated." Significant adverse impacts to land, air, water, natural resources and potential significant public health impacts that cannot be adequately mitigated. The finding, says Martens, is "consistent with DEC’s mission to conserve, improve and protect our state’s natural resources, and to enhance the health, safety and welfare of the people of the state." There are no "feasible or prudent alternatives" that adequately avoid or minimize adverse environmental impacts, he notes. Likewise, there are no "feasible or prudent alternatives" that address risks to public health from fracking. DEC based the Findings Statement on the huge amount of research included in the Final Supplemental Generic Environmental Impact Statement (FSGEIS) that they released last month. That 2,000-page document included responses to public comments and the state Department of Health’s Public Health Review, which concluded that, given the uncertainty regarding potential health impacts from high volume hydro-fracking, that technology should not move forward in the state. The 44-page Findings Statement details widespread potential impacts from fracking including impacts to water and air resources, ecosystems and wildlife, community character and public health.You can read it online at the DEC's website. EPA study does NOT say Fracking is "safe"
This is what some pro-drilling interests picked up from the press release: "Assessment shows hydraulic fracturing activities have not led to widespread, systemic impacts to drinking water resources and identifies important vulnerabilities to drinking water resources." They would like to believe that the EPA study shows that fracking is "safe". In fact, "no proven contamination" has been their motto for years. Unfortunately, early media reports simply parroted what they saw at the top of the EPA press release without reading the details or delving into the executive summary. Dive in a bit deeper and you learn what the EPA study really says: there are cases in which fracking has impacted drinking water resources, but it is not "widespread and systematic" yet. 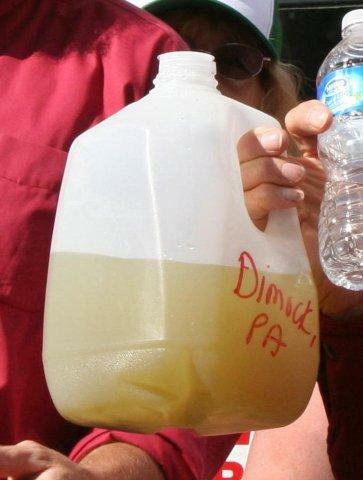 The EPA study found “specific instances” where fracking-related activities contaminated drinking water, including water wells. They didn't find it everywhere, but they only studied a handful of communities. EPA admits that their study is limited by the lack of pre- and post-drilling water quality data. They say their study is limited by the lack of long-term systematic studies. They also say that certain information on fracking was not made accessible to them. If you need a visual image to help you, check out this map that William Huston pulled together from data in Pennsylvania's Marcellus shale region. Map: (C) 2015 WilliamAHuston@gmail.com Share: CC-BY-NC -- All other rights reserved. 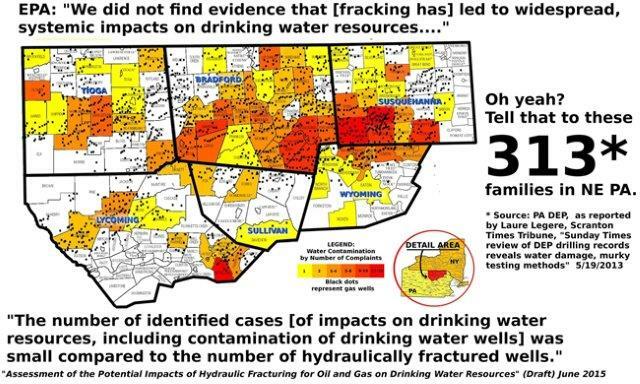 This map shows 313 cases where families in the north eastern part of the state reported water contamination. Just six counties. The red areas indicate where the most reports came from. Three hundred thirteen might not seem "widespread and systematic", but it demonstrates part of the problem with how the EPA study is interpreted. The impacts are localized. But they are systematic, when you compare where the pollution is with where the drilling occurs. EPA said its investigators found “specific instances” where one or more mechanisms affected drinking water, including contamination of wells. The agency report said the number of identified cases “was small compared to the number of hydraulically fractured wells,” but conceded it wasn’t sure why.